As my interests include astrophotography, I thought that you might like the attached movie of Comet Wirtanen that I took on the night of December 22nd. The comet is currently making a close pass of the Earth and, despite a full moon, it was quite easy to image. The movie shows it passing amongst the stars of Auriga and consists of 50 exposures of 200 seconds each with a Starlight Xpress SX-814 CCD camera and a Televue NP101 refractor. As you say, the comet is essentially tailless – just a glowing ‘coma’. I’m sure that a faint gas tail would be visible under dark sky conditions, but there was just too much moonlight at the time. The comet nucleus is very small and so a bright tail is unlikely to form. This comet was the original target for the ‘Rosetta’ space mission, but launch delays forced a change to comet Churyumov-Gerasimenko . 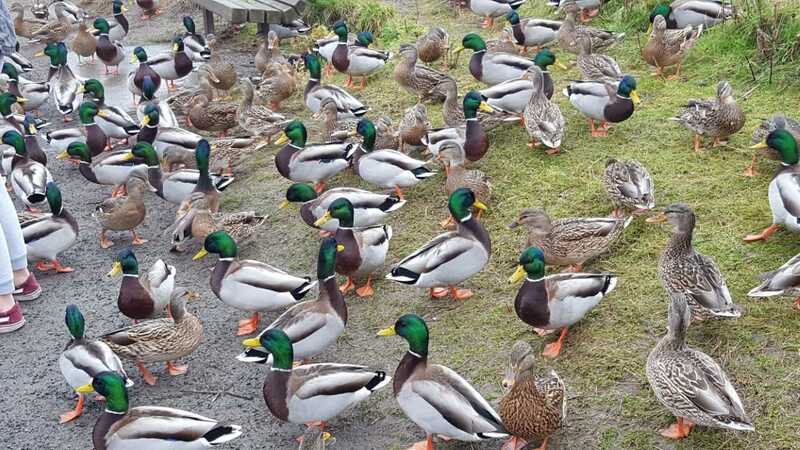 Reader Dan Morrison sent his photo of passel of mallards from Canada, asking me, “Do you know any of these ducks?” I couldn’t say “yes”. The data: “Rithet’s Bog, Victoria, BC. Xmas eve afternoon.” Apparently that place is always loaded with mallards. No, this isn’t PhotoShopped. 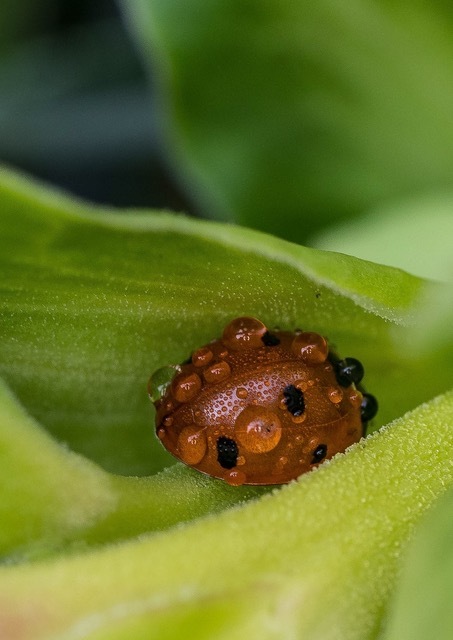 I found this ladybird (ladybug for you in the US) trying to hibernate in the flowers of a wild hellebore (Helleborus foetidus). I think it’s Coccinella septempunctata, the seven-spot ladybird, which is the commonest species here in England. For an idea of scale, the adults are between 7 mm and 10 mm long. This was photographed yesterday morning [Dec. 22], when it had been raining for some time and, as you can see, the poor creature was very wet! I’m not sure if this second photo comes within your definition of wildlife photos, though what’s here is certainly both alive and wild. These are lichens, composite organisms formed by algae or cyanobacteria living with filaments of multiple fungi in a symbiotic relationship. I don’t know the species (there are several in this photo), but you can see some of the different shapes and forms they assume. Lichens grow extremely slowly, maybe only one or two millimetres per year, and can live for many decades, even centuries. These were found yesterday, growing on the branches of an old apple tree a few miles from here. For an idea of scale, the area covered by the photo is about 1.5 inches across. This entry was written by whyevolutionistrue and posted on December 26, 2018 at 7:30 am and filed under astronomy, ducks, photography, plants, video. Bookmark the permalink. Follow any comments here with the RSS feed for this post. Both comments and trackbacks are currently closed. Great comet time lapse! Sadly no clear skies for me. Cool stuff! The duck picture is fairly amazing. I have not seen this comet, but have managed to see a few over the years. I think that is the seven-spotted ladybird beetle. I can’t think of any other with a spot pattern quite like that one. 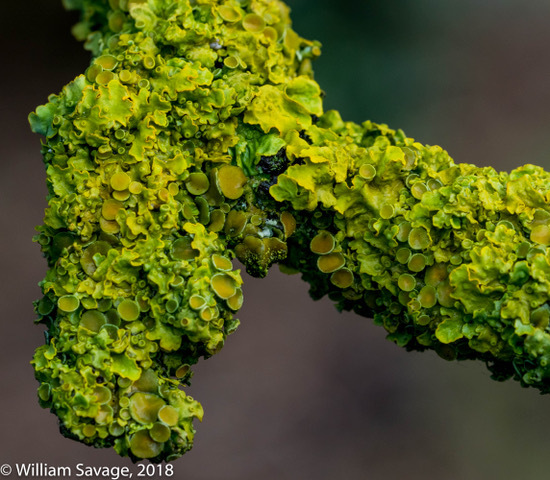 I think the lichen is Xanthoria parietina. An eclectic mix today. Very satisfying viewing. Lichens grow extremely slowly, maybe only one or two millimetres per year, and can live for many decades, even centuries. Before the development of fancy tricks like ESR and cosmogenic nucleide accumulation, this technique was one of the mainstays for measuring the age of glacial moraines, the exposure of rock surfaces, etc, for understanding the history of glaciation. It was convenient that people would erect calibration slabs of local rocks, with neatly carved dates and at a variety of orientations. Really appreciated the comet photo. Interesting that it was the original target. So hard for me to imagine landing on any comet, let alone comprehend that we, the same Homo sapiens that produced Trump, actually did it. Remember, there’s a bell curve. You probably need at least two senses to make any sense of it. Lovely pictures, Will! I did some research on lichens as an undergraduate (me, not the lichens) which sparked a life-long appreciation. I did some course work on lichens which was enough for me to hold them in exceptionally high esteem. Hey, what’re the odds?! 😀 Yes, they are very cool. In the Cascades, we found that they were contributing a significant amount of the nitrogen fixation to the mature coniferous forest. At one time their presence (or lack of same) was regarded as a good indicator of environmental pollution. I would assume that’s still the case. Yes, indeed. They are a canary in the mine. Sensitive souls. I was awed by their symbiosis of algae and fungi. They are a hint about the ways life has blended diverse cells since the origin. And who knew there was a big surprise coming concerning the fungal component–a whole ‘nother phylum represented there. Biology is just so cool!